The Bee Towers Tablet Stand is used to hold a variety of devices for a variety of uses. 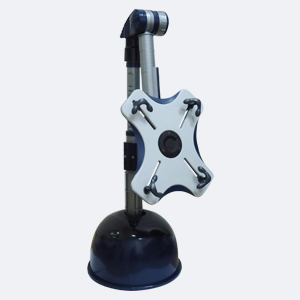 The stand has a telescoping arm, a 360°horizontal rotation, a sand filled counter weight base, and can tilt at a variety of angles for the best positioning. Possibilities for the many uses of this stand are endless! We use Bee Towers in our AT Lab and like the versatility that this stand offers to many users. This tablet and smartphone holder is designed to stay in one place, with many moveable sections to change angles and tilt in ways for users to use in a variety of positions. The Tower works with an iPad, an iPhone, an iPod Touch, a Samsung Galaxy Note and Samsung Galaxy Tab. Based on the these trials, we feel that other tablets or e-readers would also fit well. We have used it with a child with Cerebral Palsy, who uses a wheelchair, a child with Down syndrome, and several teens with a diagnosis of autism. We found it fairly easy to adjust to positions for reading, for listening to audio books and playing interactive games. Because of the positioning options, it could position a device down low for someone on the floor, and angled for someone in a bed, such as a hospital bed. It could also be used by physical or recreational therapists for safe use next to a treadmill, a gait trainer and even a stander for someone working in a rehabilitation facility as they work on balance. This item can be purchased from Amazon.